Daylight Balanced – If you have Tungsten (3200K) lights you will need to convert them to daylight or visa-versa. Small – These will be awesome for traveling. Dimmer – Great feature for getting the luminance perfect. Battery – If you can get the battery version I would. Light Power – I have the 600 version, seems a wee bit weak for anything other than 1 person interviews etc. You might want to consider getting a 900 or 1200. The ePhoto 600 is the Smallest size panel in the series. I found it makes for a great 1 subject light or background light to support larger lights. The ePhoto 900 is the second highest powered LED in the light series. I found this to be the best model to by first if you are getting started with LED lights. The ePhoto 1200 is the most powerful of the LED series and makes for a great indoor key light or outdoor fill. You can find a bag for these lights here. Great Review. I might be picking up a few of those smaller LED panels for indoor fill lights and stuff, glad you and cheesycam showed me these. Caleb thanks for the great review. It’s great that you share your experiences with people. You’ve also saved me some time with my own review, as I can now just send people to your site for background. ;) I own these lights (the 600 LEDs) and have a few things to add. 1) The 600LEDs are plenty bright if not overbright when shooting on the Sony FS100 and F3. With the light at full blast and 5 feet from someone, it overpowers the FS100 at 0DB and I’d need ND to even shoot with it that way! I had best results with the lights turned down to 1/3 power. My 60D needed to be at ISO1600 to get the same result, so obviously this is a camera thing. But the take away is if you have a sensitive camera such as the FS100 or F3, the 600LEDs are more than powerful enough, even at a distance. The cheaper yet identical lights also come with the remote dimmer, which is a plus if you have the lights on a boom or whatever and hard to reach the controls. 3) That minus green filter is a virtual requirement. Me and Ben Eckestein separately tested the lights and they have a huge green spike in them, which can cause someone’s skin to look completely unnatural. (The far more expensive LitePanels have the filter built into the LED apparently, and it showed.) I haven’t done extensive testing with the included minus green filter; it may be enough or more may be needed. My guess is another 1/8th minus green on top (for 1/4 minus green) will be the ticket, then you balance your camera on that. Overall, I love the lights. 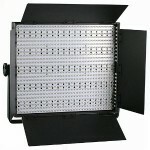 For the cost you can get 4 of them with dimmers for the price of one LitePanel 1x1s. I threw them in a Pelican 0340 cube case and with care I think they will last. But one has to be careful to gel them properly, buy bigger (as you recommend) OR use a sensitive camera, and note that they can be found cheaper if you look around. haha I do too, and you still have plenty of light for the hyper-sensitive F3/FS100. But yeah I hear you on the costs; the 600 LED especially diffused is not as bright as I’d like when shooting say, a Canon 60D SLR at it. Ah. It’s good to see these Chinese OEM instruments hitting the market. 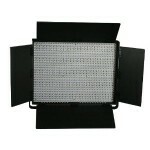 I reviewed the offerings from Shantou Nanguang along with every LED panel on the NAB 2011 show floor. Traditional color meters like my Minolta Color Meter II cannot read LED sources. To get a gander at color at NAB, I used my Canon SD990IS point-and-shoot on manual settings. Set at “daylight”, I could see what color cast each instrument suffered. The CN-600HS definitely has a green spike that is managed with -green filters as others have noted here. Interestingly, Litepanels secretly keeps hard minus-green filters that you must ask for. you can’t order them on their website. Despite LED binning (selecting from the best from those delivered by LED manufacturers) different LED types display widely varying color character. (a spot LED vs. a flood LED.) 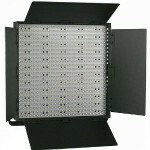 Litepanels instruments are all over the place with their CRI and color spikes. For example, I could ascertain, by eye, a significant difference between the spot and flood banks of LED’s of the Litepanels Bi-Focus instrument. My Litepanels Superspot shows good CRI with no discernable green spike according to my point-and-shoot. I haven’t done an official test with my RED One MX but haven’t notice any spike in practical interview setups. pros: Well done housing, controls, and battery/ac options. The remote jack is also excellent. Price. Watch out LitePanels. Great review … but no samples? What are you doing to secure the power source? I just got two 1200’s and am probably going to use industrial velcro to adhere the power supply to the back. I have not used those lights. look at Airboxlights.com inflatable softboxes as a way to soften the light. All LEDs have a harsh quality I find and really need some softening.